Recently we had our four-year-old granddaughter staying and playing at the Arbor House Inn B&B. She tends to romp around picking flowers and playing with Elmo, the resident cat on property. 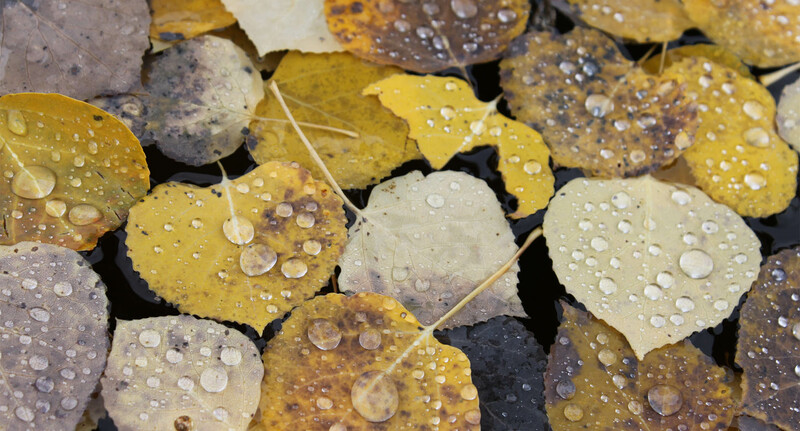 One evening, she knelt down next to one of the trees and pointed. 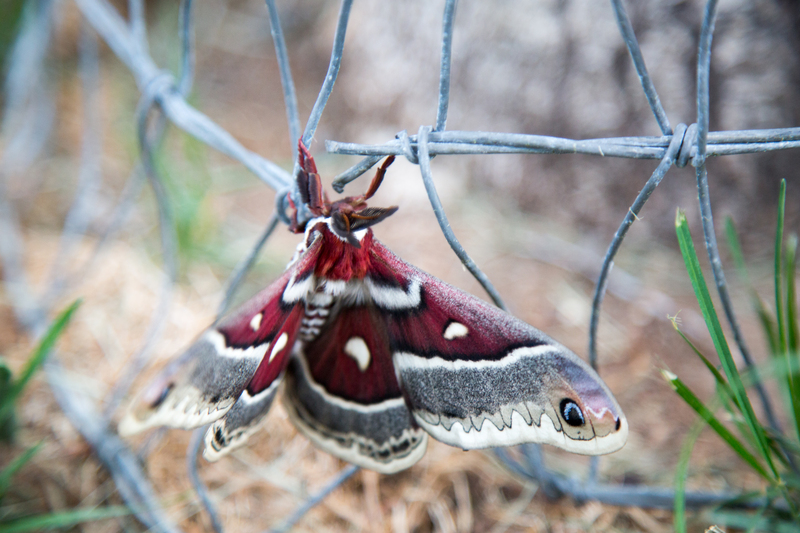 This is what she had discovered, a Promethea silkmoth as large as an iPhone. Having never seen one before, we researched and Googled to discover that they are actually an east coast insect. This poor little guy had been blown way off course! We don’t know where he was trying to go but we sure hope he gets there. If for some reason if you can’t find innkeeper Laurie Bratton, check the greenhouse. 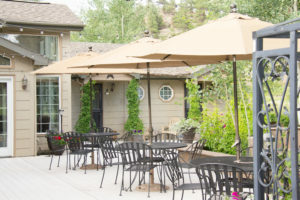 Located on the three acre property, the big dome is tucked behind the garage and the secret to the gourmet breakfasts at the Arbor House Inn Bed & Breakfast on the River. 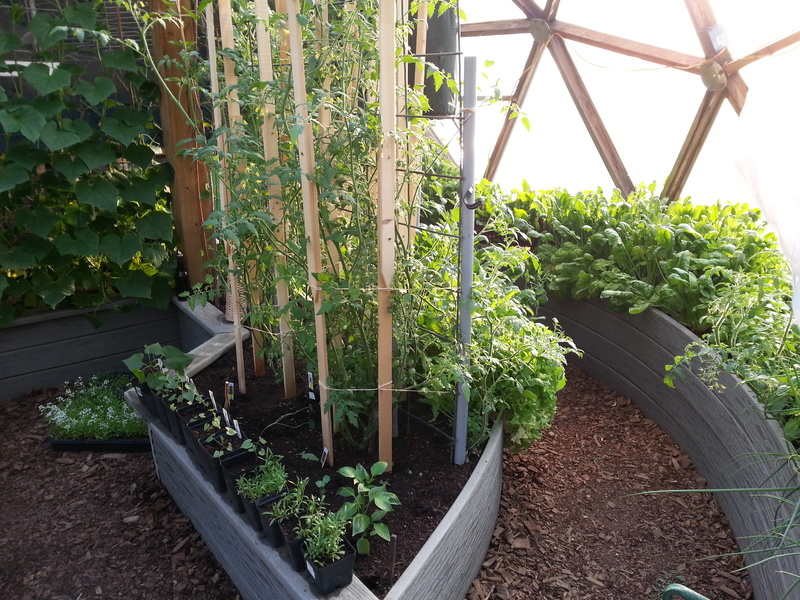 In the dome can be found fresh spices such as thyme, oregano and chives. Green spinach, cherry tomatoes as sweet as candy, and cilantro are staples at the B&B greenhouse. Laurie says she doesn’t have a green thumb, but we know otherwise. Enjoy! 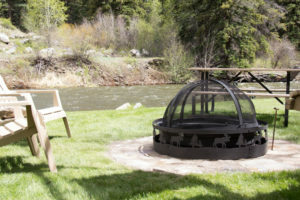 Fire Pit #3is ready to be enjoyed by guests of the B&B and Cottage on the Creek. 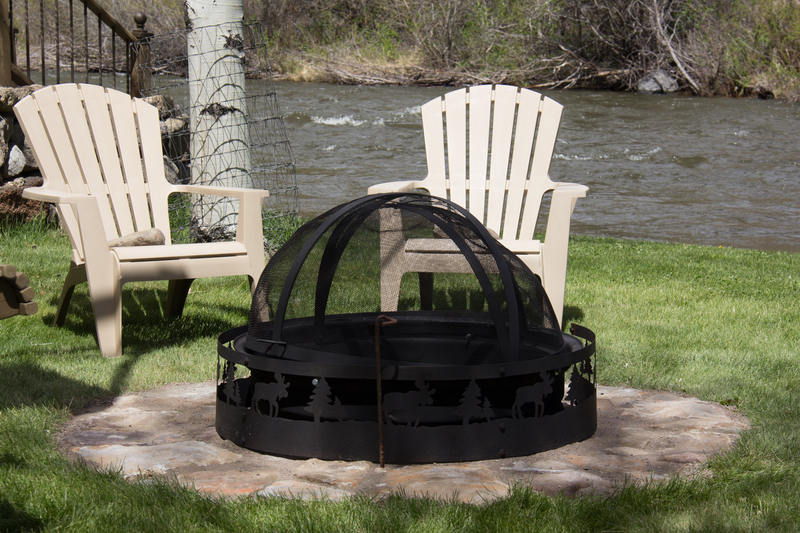 We’ve got the permits, we’ve placed the patio furniture, and now we’re ready for some s’mores and nights around the ring. As a guest of the Arbor House or Cottage on the Creek, ask Keith or Laurie for your s’mores kit and be prepared for chocolaty goodness and camping skewers served in a chalkboard pale to show up fireside. Keith will help you get the fire going if you need it, point out the tools needed on how to put it out when you’re done, and away you go! Why is it called Piper’s Party Pit? consumed by this little boy and his family at what he has lovingly adopted as his personal play space and has a wooden sign to prove it. After his little sister was born, he was roasting mallows at Camp Calvin and a worried look came over his face. When asked what was wrong he simply asked, “Where’s Piper’s place? What does she get?” We’re not sure if he truly was concerned for his little sister having her very own spot or if he just didn’t want to share his own, either way, it was a good question. Thus was born Piper’s Party Pit. 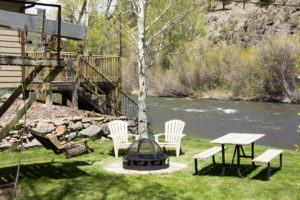 With Cottage on the Creek being added to the B&B lodging options this season as a 2 bedroom riverside VRBO, it needed its own river retreat all to itself. Piper evidently did too. So come, enjoy the new fire pit. 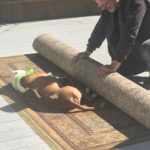 Piper would love to share it with you! These two regulars are part of the Arbor House Inn B&B funny farm. 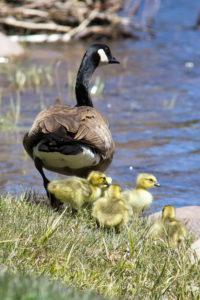 They cruise through South Fork every spring and raise their family on the banks of the river right around April or May. There’s actually about three pairs that roam these three acres, and although we’re not exactly sure where the geese property lines start and stop, Fred & Ethel have the main section along the river that seems to run from Camp Calvin down to the porch swing at Piper’s Party Pit. Canadian geese mate for life and have very low “divorce rates.” There used to be another guy that we lovingly considered the weird uncle that we called George, whom we believe was the remainder of a second goose pairing that would visit years ago. 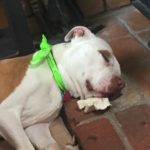 George was very social fellow and would come hang out on the wall while we mowed the lawn or swing by for snacks at happy hour while people were on the deck. During the few weeks that Fred & Ethel are here in the spring you can find them out for their evening stroll as they take their promenade through the pasture and head towards the greenhouse and eventually back to Camp Calvin. In the mornings they’ll join us for coffee out by the porch swing and enjoy a bit of “duck chow” we toss their way…if they can get to it before the rest of the funny farm finds it. 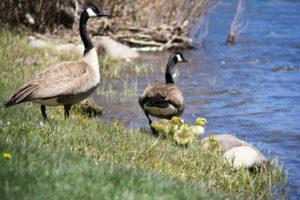 Oddly enough, geese are actually pretty poor parents. 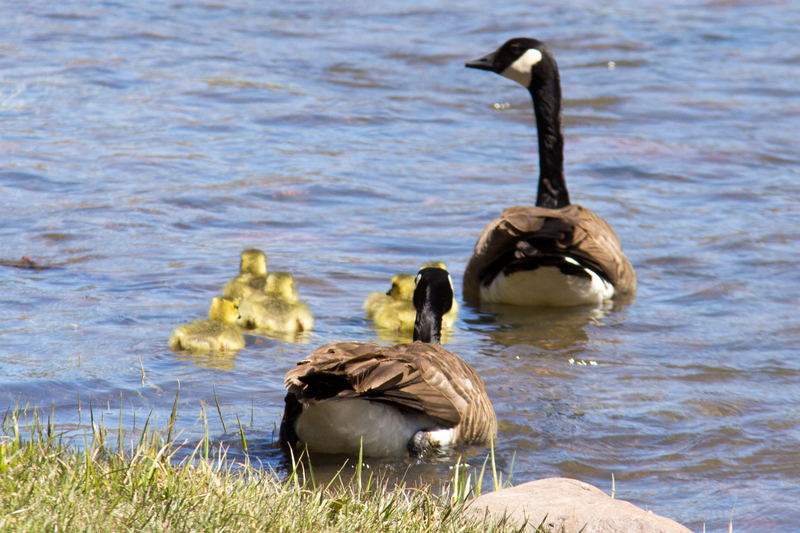 They’ll get their goslings mixed in with other goose families and don’t really keep track of their numbers. They may come to the river bank with 8 and leave with 10. We’ve even seen them leave their babies with the faux geese decoratively stationed on the north side of the B&B. We’ve tried to tell them that the garden ornaments are not babysitters, but they don’t seem to care. 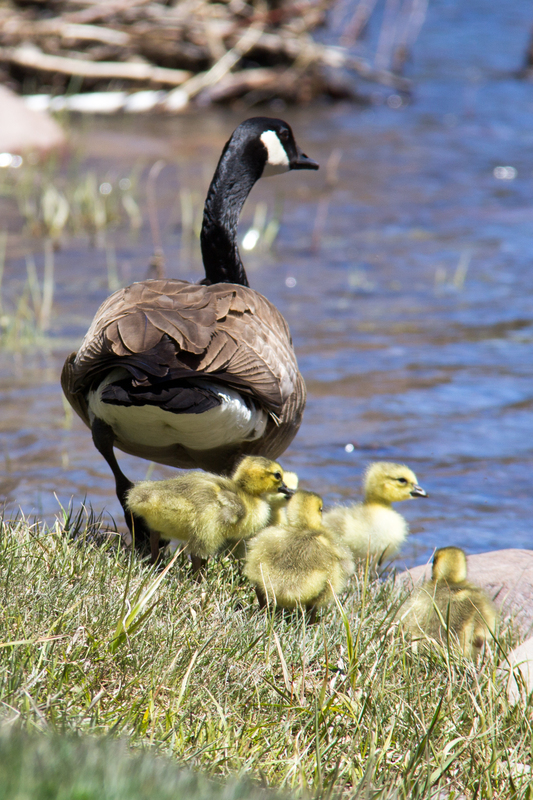 The goslings are absolutely adorable and we love having them around. Fred & Ethel stay here only a few weeks every spring, just long enough to expand their family, and then they all pack up and head out to their next destination…wherever that may be. Meet Scottie Doodles. Also known as Scottie Big Head, Big Guy, and Bubba. He’ll answer to anything really. Scottie belongs to our youngest daughter and has been in and out over the years, joining us and saying hello to guests when he can. He absolutely loves people, long walks in the woods, chewing on his toys, getting in the way, and bones from the bone bank. Well, first and foremost, he’s part of the funny farm here at the B&B. 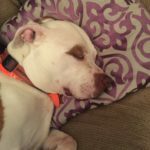 But to answer the question, Scottie is basically a mix and a Heinz 57 of everything no one likes — think bulldog, pit bull, and all the other power breeds of that nature. He’s a barrel of love that for some, comes in a package they don’t like. That’s just how God made him. Don’t worry, we weren’t too sure about him at first either. Scottie came into our world roughly four years ago when our daughter’s boyfriend passed away unexpectedly. 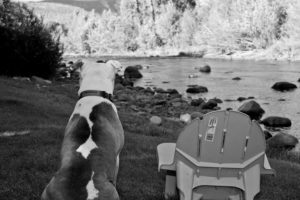 Scottie was his dog and when given the opportunity to take this big boy and make him part of her world permanently, she did it in a heartbeat. Not knowing how he would do on property with the rest of the funny farm, she brought him here on a trial period. Fast forward four years later and he’s as much a part of the B&B as the breakfasts themselves. When asked, we often hear her gloss over the “Where did he come from?” question with a smile, lovingly telling guests she inherited him. And he has been quite the inheritance! 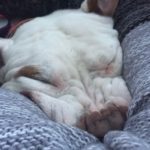 The laughs and the number of smiles this lazy dog has brought to our world and to the funny farm is priceless. You can often find Ashlee walking this gentle giant and the two weenie dogs out on Beaver Creek road, which are quite the entertaining trio and a sight to see. 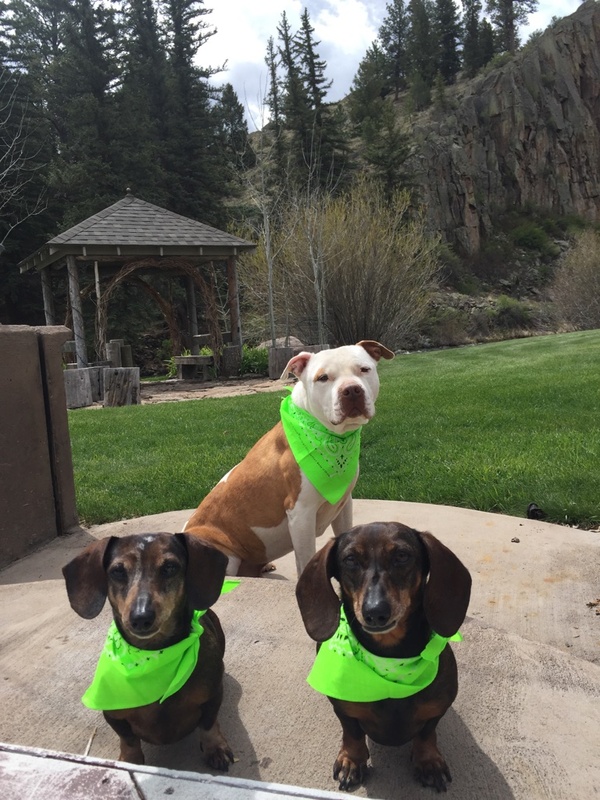 She often refers to them as “Scottie and his girlfriends” or the “mod squad” as all three dogs bound around on property and bask in the sun on the deck. Scottie might try and tell you that he’s allowed in the guest rooms, but he’s a liar. 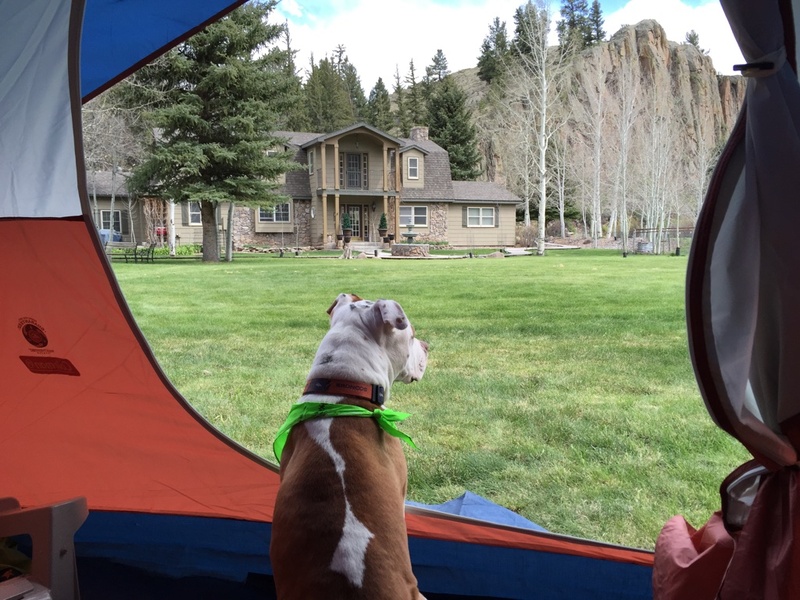 Due to allergies and guest preferences, there are no animals allowed in the guest rooms. 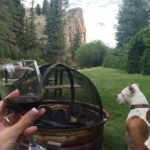 He will, however, love to join you out at Camp Calvin or while you’re sitting at the fire pit enjoying the river or a glass of wine. 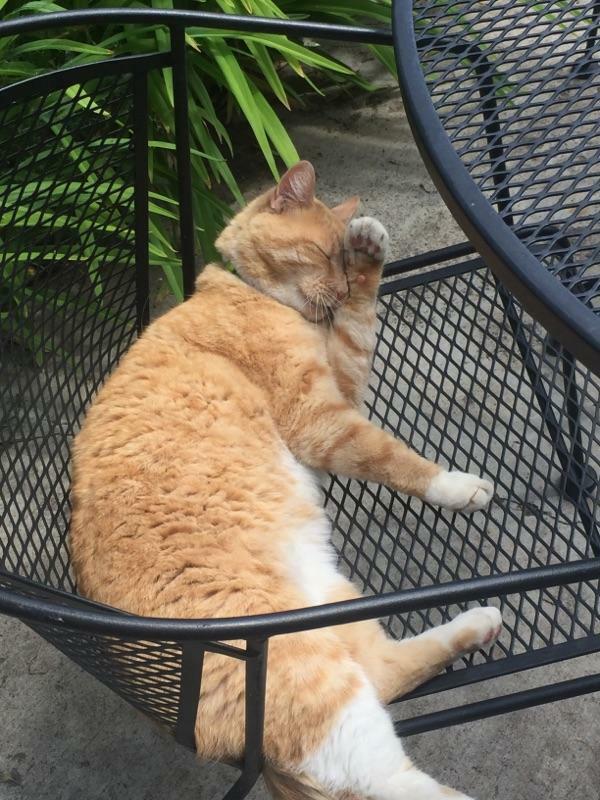 He loves people and thinks all the B&B guests have come just to visit him, but we joke that he’s an old man hermit. He already has his circle of doggie friends and is a bit protective and can be naughty when it comes to strange dogs. The funny farm has enough critters already and plenty fur friends to love on, so no other uninvited four-legged visitors please. 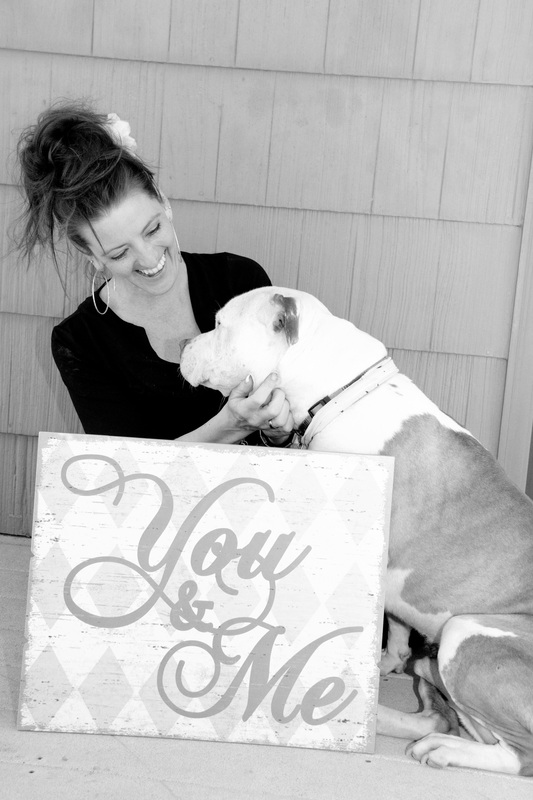 We absolutely love having Scottie as a part of our world and we hope you do too. If for some reason you’re not as taken with him as we are (or any of the funny farm for that matter) just pat him on the head and say the word and we’ll make sure he stays out of the way and doesn’t disturb you. There’s plenty of room here at the B&B for all to enjoy. The entire funny farm welcomes you to the Arbor House Inn Bed & Breakfast on the River and hopes you have a nice stay while visiting South Fork. Careful, when you’re not looking, Scottie Doodles or one of the other funny farm residents just might try and get in the car and go home with you! 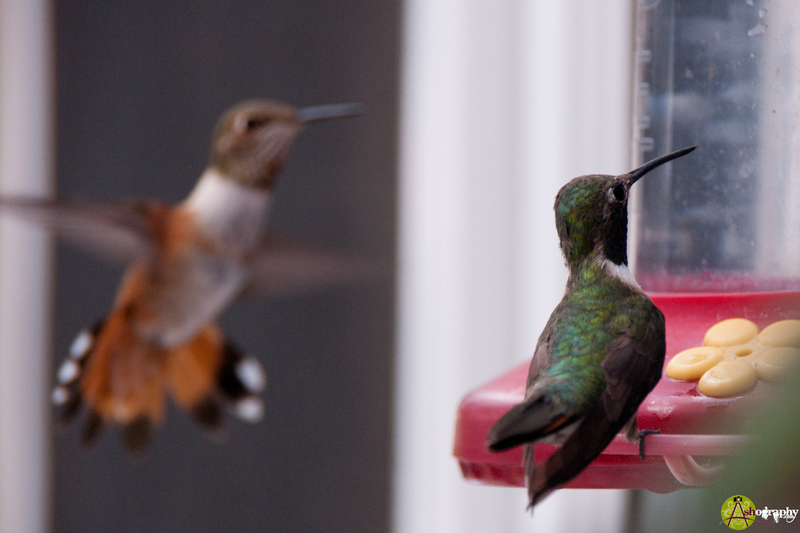 Meet the Hummers – The Bad Boys of Summer. 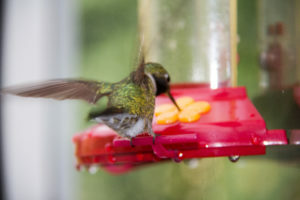 Every year there is a herd of humming birds that comes to town and takes over the bed & breakfast. One of the reasons we love being here in this area is the South Fork wildlife and its unpredictability. You never know exactly what you’re going to get. Except with the hummers. We know what to expect when they roll into the B&B. The first of the humming birds tend to arrive in late April or the beginning of May. Typically it’s just one or two scouts that start hanging around as they wait for the humming bird feeders to be hung and become available. 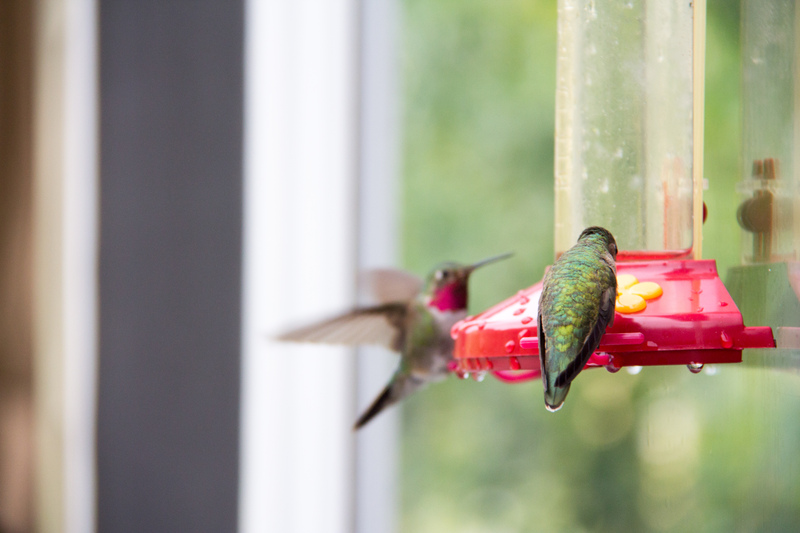 When we see them trickle in we’ll hang the red feeders on the dining room windows and lovingly announce to the B&B guests that “the bar’s open.” It’s not uncommon to get up to two dozen hummers flying around in the evening. Usually around the first week in July the Rufous humming birds arrive and they tend to make things quite lively around here. Rufous hummers are the bullies of the humming bird world and they guard the feeders and tend to dive bomb those who get too close to their watering hole. These aggressive little cuties have orangey-red chests and are feisty like their coloring. 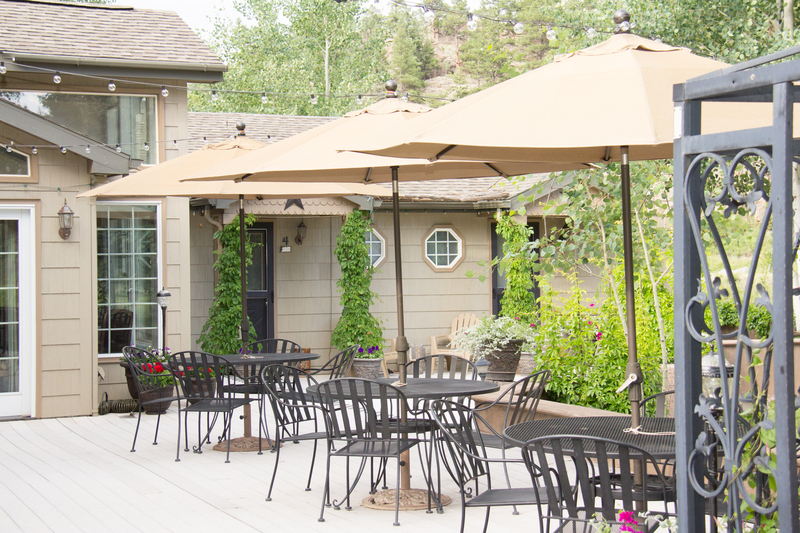 We like to cater to our winged guests and have two feeders on the windows overlooking the deck onto the river which allow our B&B guests to enjoy them from the dining room through the oversize picture windows at breakfast. These need to be filled several times a day due to our thirsty flyers. We just added the Cottage on the Creek vacation rental next door, and yes, it too has a humming bird feeder on the deck overlooking the river for guests to enjoy. One of the regular guests that come every year makes us laugh as she sets up her own humming bird feeder on the balcony of room #2, Chloe’s Corner. She brings the feeder in her suitcase, sits on the balcony and likes to have her very own hummer show while she’s here. 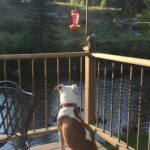 The hummers are quite entertaining and can be enjoyed while having a glass of wine on the back deck or while sitting on the benches by the river at the arbor. We look forward to their arrival every year and we hope you enjoy them too. 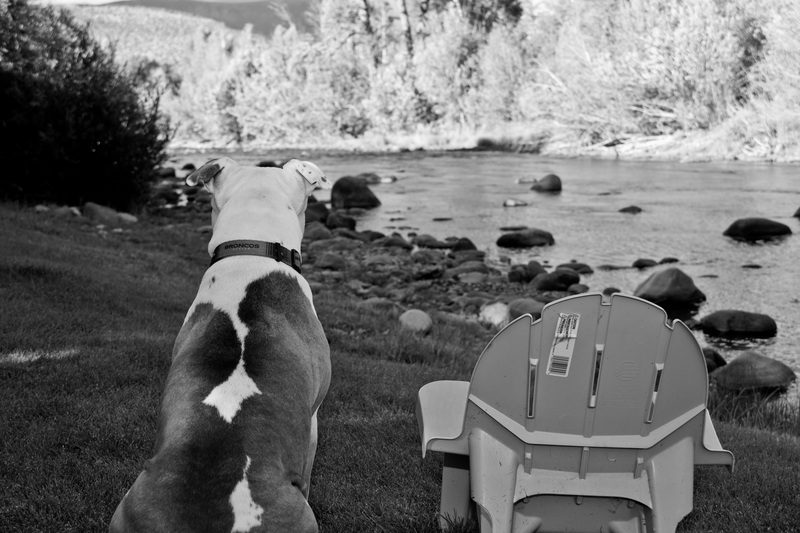 Elmo is part of the B&B funny farm here at the Arbor House Inn Bed & Breakfast on the River. 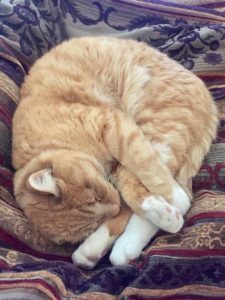 This lazy orange tabby is a rescue from the Humane Society in Pagosa Springs. Our daughter and her aunti were visiting Pagosa for the day and happened to swing by to take a peek at their kitties. They found this handsome guy and one other black cat that was in the running, and after much discussion, Elmo was the winner and came home with them. The first week here Elmo hung out on the top shelf on one of the book cases and just observed his new home. We laughed as a look of disgust came upon his face every time our two dachshunds entered the room. “Ewwwww, weenie dogs.” It took a few weeks, but soon Elmo was part of the B&B crew and fit in just fine with the rest of the funny farm. The original intent was for Elmo to be the resident mouser on property and keep the outside critters in check, but mostly he just lies around the various patio furniture and is quite worthless. He’ll often tell you he’s allowed to go in the guest rooms with you, but he’s a liar. No animals in the guest rooms please. We absolutely love this guy and we hope you do too.